Case Study: Cost Recovery under the Environmental Management Act J.I. Properties Inc. v. PPG Architectural Coatings Canada Inc.
Una Radoja is the co-chair of Harper Grey LLP’s Environmental Law Practice Group. She is a commercial litigator with a specific focus on contaminated sites litigation and risk management. Una is an executive member of the Environmental Law Subsection of the Canadian Bar Association (BC Branch) and a frequent guest lecturer for the Pacific Business and Law Institute, BC Environmental Industry Association, the Environmental Managers Association and the BC Continuing Legal Education Society. A significant component of Una’s contaminated sites practice involves litigation related to recovery of remediation costs pursuant to the Environmental Management Act and common law and appeals before the Environmental Appeal Board. Una regularly advises property owners, developers and other businesses respecting strategies to minimize liability risks arising from ownership of and operations on contaminated land. She also represents clients in their dealings with the regulator in relation to applications for orders and instruments, including approvals in principle and certificates of compliance. Una’s clients range from small businesses and property owners, to developers, strata corporations, insurers, and multi-national, large corporations and REITs. On August 25, 2014, the BC Supreme Court rendered an important ruling in a cost recovery action brought by J.I. Properties Inc. against PPG Architectural Coatings Canada Inc. pursuant to the Environmental Management Act, R.S.B.C 2003, c. 53 (“EMA”). The Plaintiff obtained a judgment against the Defendant in the amount of $4,750,000, representing the reasonable costs incurred by the Plaintiff in investigating and remediating James Island, located between the Saanich Peninsula and Sidney Island, BC. In the reasons for judgment, the court interpreted and applied several key provisions of the EMA applicable to cost recovery actions, and considered legal arguments that had not previously received judicial consideration. This presentation will involve a detailed analysis of the decision and provide important takeaways for consultants, lawyers, and property owners dealing with remediation of contaminated sites with a view to seeking recovery of related costs. Dan Leigh is the Technology Applications Manager for PeroxyChem located in Walnut Creek, CA. He is a licensed geologist and hydrogeologist with over 30 years of professional experience. He has over 100 publications and presentations on a variety of subjects including atoll island and coastal hydrogeology, groundwater geochemistry, and in situ biotic, abiotic and biogeochemical remediation of organic and inorganic contaminants. He has conducted site investigations at facilities across the United States and Internationally. Soil and groundwater at the Concord Naval Weapons Station (CNWS) in Concord, CA has been affected by a discharge of trichloroethene (TCE). The Navy desired the most aggressive technology to divest the property under the Base Realignment and Closure (BRAC) program. To evaluate the benefits of combining biotic and abiotic processes field tests were conducted which compared in situ chemical reduction (ISCR) to enhanced reductive dechlorination (ERD). This presentation will present a short description of the chemical and biological degradation pathways of chlorinated ethenes. The methods for applying these processes in situ at the Concord Naval Weapons Site will be described and will include photographs of the mixing and injection systems at the site. The resulting changes in groundwater biogeochemistry and contaminant concentrations of the ISCR and ERD pilot test will be provided graphically. The results will be summarized and conclusions based on those results will be offered. A common problem with remediation of petroleum hydrocarbons (PHCs) is a lack of understanding of subsurface distribution. Basic information is obtained using traditional boreholes and monitoring wells, but significant data gaps typically remain prior to commencement of remediation. Two high resolution characterization tools have been successfully used to define the location of PHCs in-situ, these are the Membrane Interface Probe (MIP) for dissolved phase contamination, and Laser-induced fluorescence (LIF) for free phase contamination (LNAPL – light non aqueous phase liquid). The MIP and LIF are powerful down-hole assessment tools that are used to provide semi-quantitative data on subsurface contamination. Advanced to depth by direct push methods, the surface of the MIP probe is then heated and the volatile contaminants volatilize and diffuse through a semi-permeable membrane and are subsequently transported to the surface for on-site screening analysis. The LIF consists of a probe with a fibre optic cable that emits an ultra violet light through a window in the probe during direct push advancement. The PAHs in LNAPL fluoresce and the response is measured in real time. These real time, high resolution technologies provides very detailed information about the presence and extent of PHC impacts. During this talk, each technology will be briefly discussed, and two case studies will be presented where the high resolution characterization tools were used prior to and during in-situ remediation of PHCs. This talk will present the pre-injection high resolution characterization tool results and showcase how the remedial design was focused and re-designed as the program progressed. 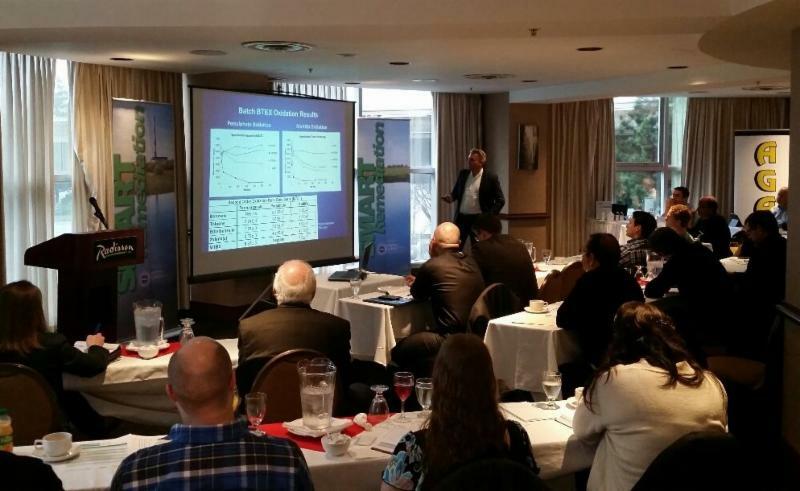 Thank you to all the attendees, presenters and sponsors, for making the SMART Remediation Technical Learning Seminar on January 27, 2015 in Vancouver a success!